The main opposition Maldivian Democratic Party’s meeting hall on Kurendhoo island was shut down Saturday ahead of an official visit by President Abdulla Yameen. According to the MDP, police officers also removed opposition banners and flags from the harbour area. Before the president arrived and until he left, policemen stood guard outside both the MDP and coalition partner Jumhooree Party’s meeting halls on the island. MDP offices and meeting halls have been shut down on several islands ahead of the president’s visits in recent weeks. Megaphones and loudspeakers were confiscated on Velidhoo island last week as police officers took down anti-government banners and arrested three people. Dozens of police officers and armed soldiers descend on islands ahead of the president’s visits. Yameen visited Kurendhoo to mark the completion of the island’s shore protection project, after which he spoke at a campaign event and launched attacks against his opponent in the September 23 election. Aishath Vishama, the Kurendhoo council president and a member of the ruling Progressive Party of Maldives, told Mihaaru that police took down flags of all parties at the harbour Friday night. They were put up within a security cordon, she said. “The flags were removed to make a walkway and for security reasons because the president was coming. PPM flags were among them as well,” she was quoted as saying. The police say banners and flags are removed with court orders to prevent unrest. Earlier this month, the Kolamaafushi magistrate court issued a warrant authorising police to confiscate flags, posters or banners, citing police intelligence information about plans to use megaphones to disrupt functions with the president. 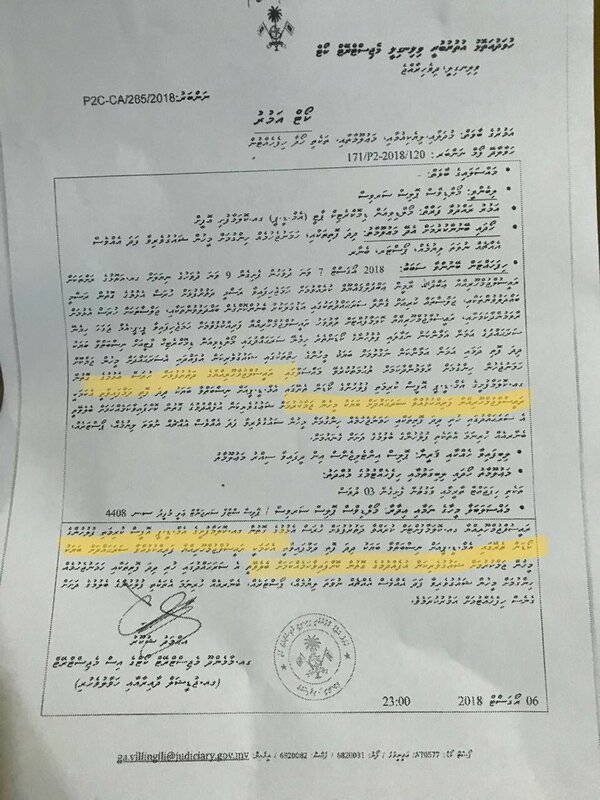 The flags were draped outside the MDP office with the intention of drawing a crowd and creating a disturbance while the president’s entourage eats at the nearby ruling party office, the warrant stated. A painting of former president Mohamed Nasheed at the MDP office was also blotted out in the early hours of the morning before the president’s visit. Two opposition lawmakers who were campaigning on the island were briefly detained.